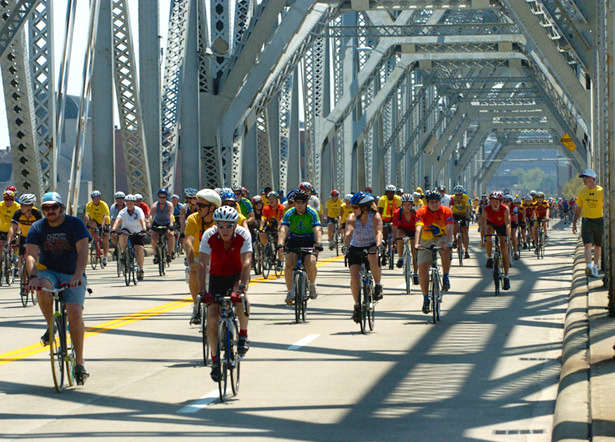 The best way to see Louisville is by bike! We invite you to enjoy some of Louisville’s greatness and beauty, but also hope you will learn from some of our urban mistakes. For instance, Louisville recently completed a $3 billion highway project, yet we have a weak public transit system, we cannot repair sidewalks and we keep building surface parking lots. The lesson is one of priorities. Our community priorities shifted from downtown and her surrounding neighborhoods to suburbia and exburbia. In the early 1960s Market St (this tour begins at our shop at 107 W Market St) was bustling with prosperous commerce and with people living above their mom and pop shops built in the 1800s. The merchant family who lived on the 2nd & 3rd floors of our building made their living selling wallpaper from their street level shop. In 1960 Market St had 84 furniture stores, 26 hardware stores, 14 banks, 53 bars, taverns & saloons. Then, everyone who could, moved to the suburbs. Our 2 way streets were converted to 1 way so folk working downtown could drive quickly out to suburbia – to mow their green lawns. And with the middle class gone elected leadership instituted Urban Renewal – this is the late ‘60s/early ‘70s. All architecture of the 1800s on the south side of Market St was bulldozed all the way to I-65. The north side of Market St still has some of the old historical structures. When we cycle down Main St you will see some of the architectural beauty that escaped the bulldozers. So! let’s ride! Work your way north to the Ohio River and the northeast corner of the Great Lawn of Waterfront Park (NW corner of Witherspoon and Preston). Waterfront Park is 110 acres of what was formerly a huge junk yard full of scrap metal. The Great Lawn is the home of many summer festivals. Catacorner is the back side of Louisville Slugger Field. Named after Hillerich & Bradsby’s baseball bat, the Louisville Slugger. Later we will cycle past the H&B museum & factory. Slugger Field is the home of Cincinnati Reds’ AAA farm team – the Louisville Bats. The structure on the north side of the ballpark was originally the Big 4 railroad freight house. The arched entries facing us were gateways. Horse & mule drawn wagons would on and off-load freight from the trains inside the freight house. Across the street is the green roof of Preston Point. Architect & redeveloper Henry Potter designed & built Preston Point. Henry Potter, Bill Weyland, Steve Poe and others comprise a pantheon of local heroes (sometimes controversial) – redevelopers of urban Louisville. Note, we use the term redevelopers, avoiding the term – developers. There are redevelopers and then there are those who destroy farms, fields and forests. There are no developers. That recent red tower to the west is part of the re-peopling Louisville. Ah, you noticed the metal birds – Finn’s Hens. Louisville is proud of it’s food, boasting organic, hormone free, local products. This morning you might have enjoyed an omelette from this flock of free range fowl. Let’s go on north to the river. Stopping east of I-65 bridge, which opened 4 days after Kennedy’s assassination (1963). The bridge is named in his honor. I-65 cut thru the heart of downtown Louisville. We lost entire blocks of residences and businesses in historic structures. Today, just upstream from Kennedy we are building another 6 lanes of bridge. Four miles upstream from that bridge, we are building yet another 6 lanes of bridge over the OH R. Last year we bulldozed more buildings downtown, as well as farmland and forest upstream for the approaches to the 2 bridges. All part of that $3 billion project, accompanied by heaving sidewalks and monstrous pot holes. We learn slowly. 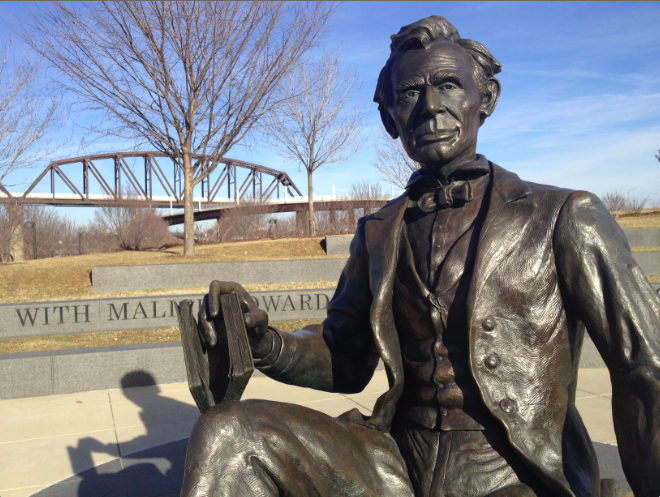 On the way to the Big4Bridge, which stands behind you, we will pass the Abraham Lincoln monument. Lincoln was born here in KY. We will come back to the monument on our way back and spend a moment there. From up here on the KY end, the east end of the Big 4 Bridge we have a nice photo-op. The Big 4 bridge was finished in 1895, at a cost of the lives of 37 workers. The railroad abandoned it in the ‘60s. Again, those are the Urban Renewal years. The bridge abandoned, the approaches to the bridge were removed. On the other side of River Rd you can see the concrete footers that supported the original ramp up to the bridge. So, the bridge hung over the OH R with no approach on either end of the bridge for 40+ years – earning the nickname ‘The Bridge that goes nowhere’. We reopened the bridge to the public in 2013. We take great pride in the Big 4 – with one notable exception. Let’s step over to the west side of the bridge. This beautiful ramp spirals inaccurately around an axis, a focal point, maybe even a sacred space. And rather than honor that space with emptiness or some significant object, we filled it with a parking lot and a toilet. More great urban planning. On the upstream/east side of the bridge us is the boat house of UofL’s row team. East of that is the old UofL facility, now used as a public boat house. The island is Towhead Island, formed after the 1822 sinking of a flatboat. (1822 is 40 years before the Civil War.) Sand collected at the site of the sunken vessel forming a tiny island. There is also a creek just upstream from Towhead Island that empties into the OH R – Beargrass Creek. On its way to the OH river Beargrass Creek flows thru a community called Butchertown. 300 years ago Beargrass Creek flowed from Butchertown to downtown Louisville. In 1850 a channel was dug to re-route the creek to keep it out of Louisville. The new channel took Beargrass Creel from Butchertown directly to the OH river. Butchertown was as it sounds – a town of slaughterhouses where thousands of pigs, cows, sheep, goats met their end. Butchertown was once known for how filthy is was. Children were sometimes paid by the slaughterhouses to kill rats. Beargrass Creek was the disposal system for the slaughterhouses. Waste from Butchertown’s industry flowed so thickly that area residents would skim the tallow from the creek and render it into candles and soap. It is understandable that the city fathers did not want the slaughterhouse waste of that fetid creek flowing thru Louisville. So… a channel was dug and the waste emptied directly into the OH R. Which brings us back to Towhead Island. Towhead grew from sand collected around the sunken flatboat to it’s current 12+ acres thanks to the mud, silt and detritus from the rerouted Beargrass Creek. Towhead is owned by Nugent Sand. Those are Nugent barges tied to the trees of Towhead Island. 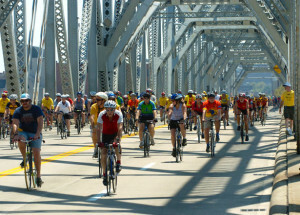 OK, let’s ride part of the Big 4 bridge. There is much to see in Indiana, but if we do Indianawe will miss dinner. 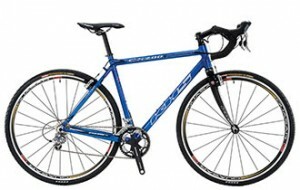 So, we will ride the Big4, stop to take a look at Indiana, then turn around, come back and ride downhill to the Marina. Oh!!! STOP before going down the ramp and check your brakes before we go back down. 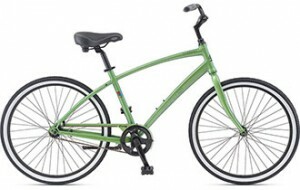 Keep your speed slow and ride to the corner of Dock View and River Shore Drives. The marina, once known as the Municipal Boat Harbor, was in ruins until redeveloper Steve Poe designed & built this complex. The original boat harbor was dug in the depression – another product of the WPA – Work Project Administration – courtesy of President Franklin D. Roosevelt. Between the river and the new structures stands the old mansion known as the Padgett House – the last remaining house from what was once an elegant neighborhood of the 1850s. Steve Poe’s group will renovate the Padgett House and the space between the harbor and the new redevelopment. From the corner of River Shore and Frankfort Ave we can view the Heigold facade and the beginnings of Louisville’s botanical garden. Across River Rd is all that is left of the Heigold House – built in 1853 by German immigrant, Christopher Heigold. The house stood originally on this side of River Rd as a neighbor to the Padgett House. In 2014 Botanica planned and planted the little gardens on both sides of the Heigold facade. Dubbed the Founders’ Garden – the beginnings of the Waterfront Botanical Garden. There is a 22 acre patch of woods just east of and uphill from the Heigold Facade. That 22 acres was for many decades the site of private and municipal landfills. A burning, smoking, smoldering dump it was also home for many during the depression living in third world conditions. It is still home to some of our homeless. Tho long closed as an active dump, the city contracted in 2014 with Botanica, a non-profit, to redevelop the 22 acre site as our botanical garden. Stay tuned. On to the Belle of Louisville at Fourth and River Road. “The Belle of Louisville, built in 1914, 100 years ago. The Belle is the oldest operating steamboat in the United States, the oldest operating steamboat of its class in the world – that would be the Mississippi class, and she is a National Historic Landmark. In years past this river was full of paddle wheels & flatboats dropping off & picking up goods. Boxes, bales and barrels travelled between the docks and the wholesale warehouses of Main St. Let’s follow the path of those goods from wharf to warehouse. First, we stop at the flood wall at 2nd St and River Road. A series of levees, floodwalls and flood gates parallel both banks of the OH R. In 1940 we were building flood walls to keep the river in the river bed. Three years earlier we experienced the Great Flood of 1937. The river crested 30’ above flood stage. 200,000 people were stranded in downtown Louisville. Martial law was declared. In today’s dollars, Louisville had over $4 billion of damage. Local officials and national newspapers wondered if the city was even worth rebuilding. Lucky for us, the floodwall was built and the worthiness of Louisville was quickly re-established. Above us is the Clark Memorial bridge. Also known as the Second St bridge. Part of US Hwy 31. Built in 1929, named after George Rogers Clark, founder of Louisville. Louisville was founded in 1779, 3 years after the Declaration of Independence. George Rogers Clark should not be confused with his younger brother William Clark who Thomas Jefferson sent with Merriweather Lewis on the Lewis and Clark expedition – 1803,4,5. More on that later. We are on the backside of the arena – home of University of Louisville basketball and many concerts. And that structure across the street to the east is the headquarters of the Presbyterian Church USA. So we have the Presbyterian faith here, and the basketball faith there. Note the difference in size. Ok, let’s continue our trip from the docks to the wholesale warehouses on Main St, then on to the retail shops of Market St. At the SE corner of Washington and Main – theTroll. Barrels of whiskey, boxes of dry goods and bales of cotton moved up and down the river bank on slave and free labor, in and out of the backdoors of the wholesalers here on Washington St – the back side of Main St. This block is referred to as Whiskey Row. 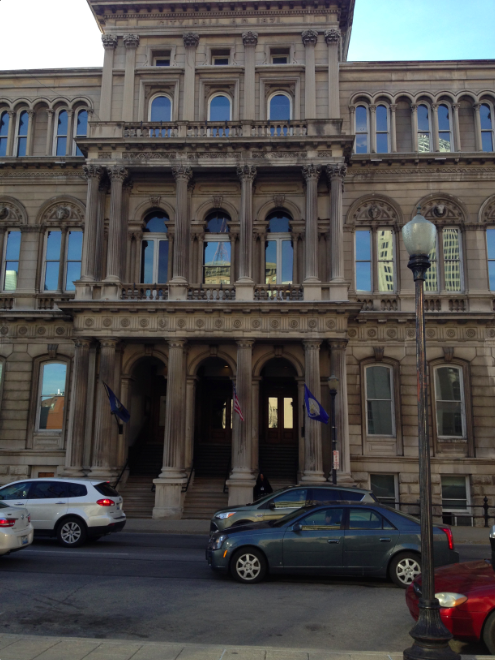 It is currently being redeveloped by Bill Weyland and others. 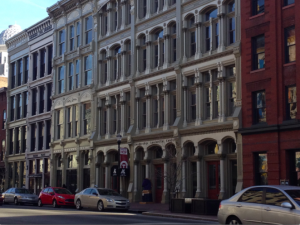 We will see the fronts of these buildings in a bit on Main St.
First, lets go to Slugger Field by riding east on Washington St then south on Preston St to Main St. This is Slugger Field, originally the Big4 freight house. A statue of Peewee Reese presents a photo op for you baseball fans. Henry Potter’s Preston Point is on the north side of Main St. Another new building, the Fleur de Lis, is across the street on the south side of Main. Reinvesting in downtown. On the other/west side of Preston Point is the home of the Louisville Ballet. Across the street from the Ballet and across the street here are surface parking lots. Louisville has an obscene number of surface parking lots where once stood productive, historic architecture. OK, we are going to cross Main St in the cross walk & travel in the south lane westward to Whiskey Row. At the SE corner of 1st & Main we can see the old Belknap Hardware building, now occupied by Humana. Whiskey Row is being redeveloped from the west end of the block eastward. It is said the commonwealth of Kentucky has more barrels of whiskey than people. KY, like MA, PA & VA, are commonwealths, not states. The terms are near synonymous. Commonwealth is a 17th century term, states is an 18th century term. You can see we have a new hotel coming in on this corner. (Aloft) The new structure will incorporate the facades of the old architecture. Behind us, occupying the ground floor of this parking garage is the University of Louisville’s glass blowing studio – one of 2 glass blowing studios we will see today. This block at the corner of 1st & Main, prime address in any city, is occupied mostly by surface parking lot. The block to the east is also over 50% surface parking lot. 1st & Main, a prime address in any city, but here it represents an example of terrible land use. Point of reference… the bike shop is on the south side of this block. Let’s move down the sidewalk to the west corner of the block. At the SE corner of Main and 2nd you can more of Whiskey Row. The Lofts is a Bill Weyland project. Bill is the redeveloper of this corner, of the Henry Clay Hotel, of Glassworks (we will see Glassworks) and of numerous other downtown assets. Bill should be mayor of Louisville. Across the street is the Clark Memorial/2nd St/US 31 bridge – we were underneath this bridge a few minutes ago. Note the image of the two friends shaking hands. That is a state emblem. Our history suggests we should keep an eye on those two. They will break out into a fight again as they have in the past. West of the bridge is the arena, home of the University of Louisville’s Cardinals. And here behind us is a historical marker documenting the 3-4,000 slaves annually sold & exported down-river. That too is part of our history. Take the time to read it. Historical markers are sprinkled all over Louisville. There are ten museums along Main St. As we cycle slowly down Main Street, look to the south side of Main and admire the old bank building that now houses Actor’s Theatre. 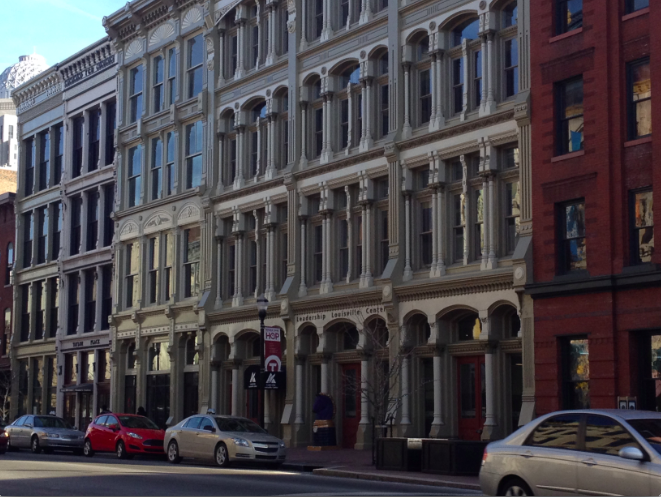 Note the iron facades along Main St. We have one of the largest collections of iron facades in the U.S. Earlier in our history iron facades were fashionable and relatively cheap. They could be ordered from a catalog to spruce up a building. At Fifth and Main, turn north riding up to the Belevedere. Go all the way to the north handrail peering over to the OH River. Downstream is the still active 14th Street railroad bridge the first bridge in Louisville to cross the OH R. It passes over the Falls of the OH. The Falls of the OH are our reason for being. The shallow falls were a convenient crossing for buffalos, indians and early settlers. The river banks along the falls became a staging area for adventurers. That staging area became a trading post, became a village, a town, a city. The early community in the west end is the oldest part of Louisville as a city – Portland. Named for the port on the south side of the falls, Louisville’s first homes were built here. Many mansions of steamboat tycoons still stand, but the most common housing type was the shotgun, brought up the river from New Orleans by french fur traders in the 1800s. The oldest still standing dates from the 1880s. When the city experienced an industrial boom, the housing type was a great way to build dense housing stock on small lots so the style was adopted in immigrant factory communities like Germantown, Smoketown, Paristown, and Irish Hill. Today, Louisville has the largest collection of shotgun houses in the country, but they are at risk of being destroyed. A local son and black hero of Louisville is Muhammad Ali. The building to the west with the tile facade is the Muhammad Ali Center. If you squint your eyes you can see him floating like a butterfly, stinging like a bee. The center hosts a very interesting museum – one of 10 museums along Main St.
Downstream beyond the falls are 4 islands, a canal that opened in 1813, a lock which makes the river navigable for barges and tugs, a hydroelectric plant, the K&I bridge owned by Norfolk Southern Rail Road, and the Sherman Minton bridge carrying the traffic of I-64 to St Louis. 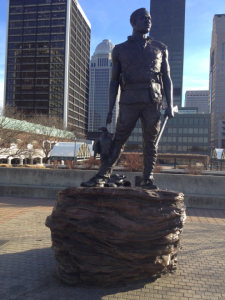 Move to the statue of George Rogers Clark. George Rogers Clark founded Louisville in 1779, 3 years after the Declaration of Independence. George Rogers Clark, not to be confused with his younger brother William Clark who Thomas Jefferson sent with Merriweather Lewis on the Lewis & Clark expedition – 1803,4,5,6. Move to the statue of York. Lewis & Clark began their expedition at the falls of the Ohio River. Accompanying them was William Clark‘s slave, York. York became a highly regarded partner during the expedition but suffered an unknown fate upon returning to what then passed as civilization. York is very photogenic with the city in the background. OK, on to the KY Center for the Performing Arts. Check your brakes before heading slowly downhill to the KY Center for the Performing Arts. (SE corner of 5th & Main). Across Main St is Humana’s headquarters. Looking west, please note that the Urban Renewal bulldozers were not allowed to tear down the structures here. Some of them have been rehabbed and now house 21C Hotel & Museum, the Hillerich & Bradsby factory & museum – Home of the Louisville Slugger, the KY Arts & Crafts Museum, the Science Center, the Frazier Historical Musem, etc..
On to Main & 8th St. Hillerich & Bradsby, across the street, an architecture photo op for some & for baseball fans, the Louisville Slugger photo op. On to SW corner of 9th & Market, the GlassWorks. Let’s peek into the windows to see what art is being created today at GlassWorks. The glass blowing studio, residential units, commercial units and community meeting space housed in this rehabbed building are all gifts to the city from Bill Weyland, redeveloper. Looking west we see two distant towers on the other side of the OH river – smoke stacks of Gallagher Station power plant owned by Duke Energy – providing electricity for southern Indiana & pollutants for Louisville. As we bike east on Market St please note the number of parking garages and surface parking lots – a great waste of urban space. 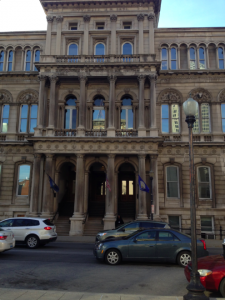 OK, we are going to make our way to the south side of Market and turning south/right on to 6th St.
To NE corner of Jefferson & 6th St – the seat of local government. This intersection, on one corner or another, has housed local government since 1790. The mayor’s office is on the east corner, Council members offices on the west corner. Note the heads of mules, hogs & cows on the face of council’s hall – reminders of our agricultural heritage. You thought I was going to say something sarcastic. The statue is the photogenic Louis XVI, king of France, foe of Great Britain in 1776 Revolution. The statue was commissioned by his daughter. Less than 20 years after 1776. Louis was decapitated as a result of the 1st French Revolution. 25 years later (1829) the 2nd French Revolution broke out, during which this marble statue, then in France, was moved to safer place in France, moved again, forgotten and then rediscovered in 1899 (70 years after the 2nd French Revolution) – rediscovered in a Montpellier basement. It had survived revolutionary turmoil with the exception of having an arm broken off. Montpellier, sister city to L, gave the statue to L in 1967. Move 1/2 block east to the statue of Thomas Jefferson, principal author of the Declaration of Independence, articulator of human rights, yet, a slave holder, third US president, organizer of the Lewis & Clark expedition, responsible for the Louisiana Purchase, campaigner against state financial support of churches in Virginia, creator of the phrase “wall of separation between church and state” . 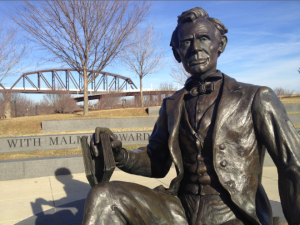 The statue was designed & created by Moses Ezekial and given to city in 1901. Thomas Jefferson – this is Jefferson St. Louisville is in Jefferson County. One of our Unitarian churches is called Thomas efferson Jefferson Unitarian Church. 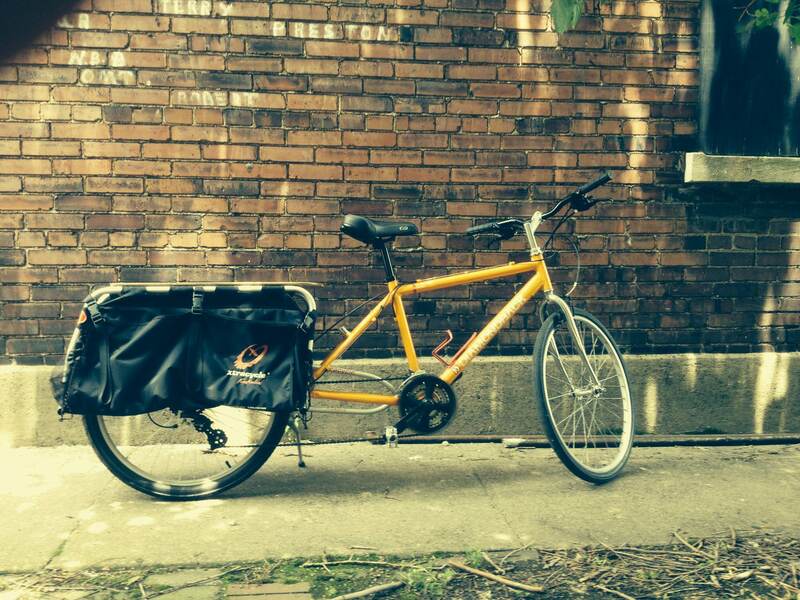 Ok, we are headed back to the Bike Couriers Bike Shop. As we ride east on Market St note the lack of historical architecture on the south side of Market St & the few remaining 19th century structures on the north side. At the shop (107 W Market St)…so concludes Louisville’s Urban Bicycle Tour. Congratulations, you rode 8 miles, enjoying fresh air, getting some vitamin D, increasing your cardiovascular wellness, enhancing the fabric of our community and burning a few calories. Go, eat heartily, sleep well & come back often. Feel free to print out the ‘guide’ and ride!!! !